For five decades Robert Gordon Mackie has dressed some of the most glamorous and a few of the most outrageous entertainers in show business. Designing for movement, personality, character, camera and stage, his imaginative regalia created iconic signatures. 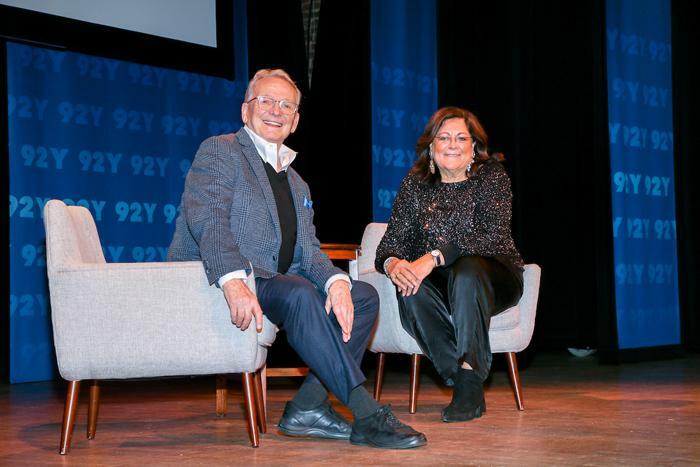 Fern Mallis * introduces Mackie by telling us “Everyone who walks or designs for the red carpet owes him a debt…He’s impacted our notion of glamour for half a century…” This audience doesn’t have to be told. The preternaturally young looking, 80 year-old artist takes the stage to prolonged cheering and applause. Mallis begins questioning at the beginning. Mackie is a native Californian predominantly raised by a British grandmother who felt children should be seen and not heard. She offered security. His father didn’t “get” him; his mother insisted on freedom to date after divorce. As a young man, Mackie was drawn to Technicolor movie stars like Carmen Miranda. The ballet from An American in Paris cinched choice of profession. “I could do that,” he thought. Confidence came early. Art school and specialization followed. As a sketch artist for Jean Louis, Mackie was serendipitously given the assignment of creating a dress for Marilyn Monroe. The iconic, “naked” garment, precursor to Cher’s beaded ensembles, fit like second skin. Monroe was famously stitched in to sing Happy Birthday to President Kennedy. Reaction is legendary. Next, he was hired as Ray Aghayan’s assistant on The Judy Garland Show. “Judy was a handful to deal with…” is all Mallis can get out of him about dressing the diva. “If you went to her house on a Sunday night, you’d watch (Ed) Sullivan first. She’d say terrible things about the singers. Then her show came on…” He imitates Garland enthusiastically slapping her hands on the arms of a chair. The now deceased Aghayan and Mackie opened a workshop together and became life partners. Mitzi Gaynor, “the epitome of the 1950s,” needed costumes for her Las Vegas act in the mid 1960s. 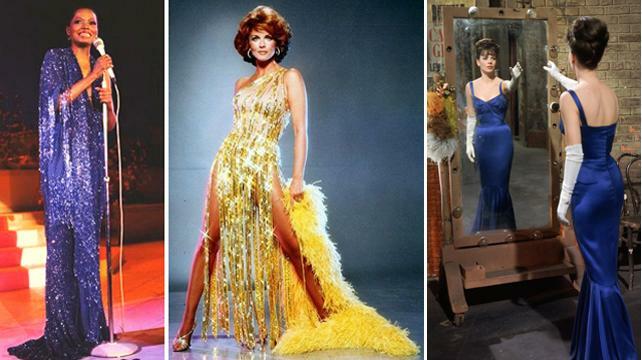 Glitzy garments were not only flattering, but moved like a dream. Though Mackie says he’ll work with any body shape- he once designed for the ample Totie Fields, it’s always been important that a client is a good performer. Mallis quotes Burnett as having said “he came to the door looking like twelve years old with the most beautiful baby face.” “That’s true,” Mackie acknowledges grinning. Youthful appearance worked both for and against. The designer tells us Dinah Shore at first dismissed him out of hand not trusting what she presumed was lack of experience- only to return as a client years later. Mackie recalls that after Cher failed to be recognized as an Oscar contender for Mask, she was downhearted. That year’s red carpet outfit would show them all. “Let’s do something kind of Indian, like we used to do in the old days,” she suggested. The flamboyant two-piece ensemble featured signature exposure with strategically placed beading. He protested she’d take attention from the winner. “She was game for anything,” he comments, a testimony proven by archived shows and live acts alike. In fact, exceedingly laissez faire, Cher rarely saw the costumes before they were completed and “I avoided her like crazy.” Mackie is nothing if not candid. Also, showing his work off to its best advantage, “she wore everything as if it was a tee shirt and jeans.” Just last year, visiting Provincetown, Mackie was followed down the street by 5 Cher drag queens. It was, he says, discomfiting. In the 1980s, Mackie made a foray into the fashion business. Though he mounted theatrical runway presentations to keep his hand in, the business was not ultimately satisfying. “I need to do work where people really clap and trunk shows were agonizing.” Bette Midler’s televised Gypsy as well as commissions from Diana Ross and The Supremes put him back where he felt he belonged. 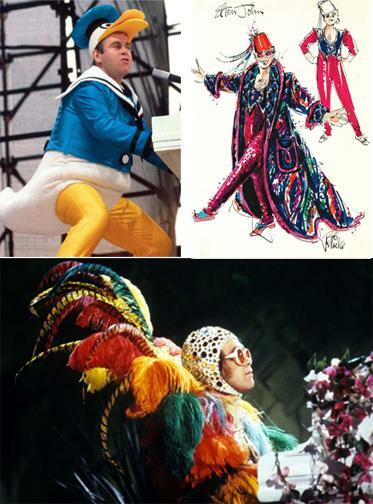 Elton John requested “things like you do for Cher.” These included a wildly creative Donald Duck costume, a sequined Dodgers uniform, endless fantastic jumpsuits. “… like Liberace on acid,” he quips. Mallis ends by asking her subject about Broadway’s The Cher Show. Accidentally running into the actor hired to play him, Mackie asked that he not be portrayed as “ a screaming pansy fairy” which is exactly what transpired. Arms waving, he demonstrates the ostentatious take. 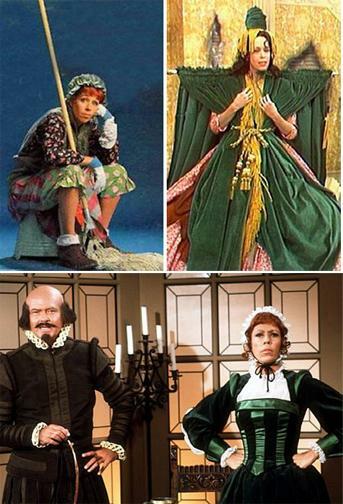 When Cher visited rehearsals, however, she pointedly observed “If he’d been like that, I never would have kept him on.” The thespian was replaced. Current depiction, though still a bit over the top, is one with which Mackie can live. To what, Mallis asks, do you attribute your success?” “’Being part of a team, Mackie replies, working FOR the show.” And what is it you really want out of this? “A lot of smiles a lot of applause. We all like applause. We’re all whores.” Bob Mackie is charming and rather mischievous. Skill, imagination, customization/awareness of context and client and dedication are hallmarks of his work. This artist has FUN! Among Mackie’s many awards are 9 Emmys. He dressed some of the most spectacular, collectible Barbie Dolls you’ve ever seen and worked with, in part, Carol Channng, Bernadette Peters, Alexis Smith, Diana Ross, Ann-Margret, and Liza Minnelli. There are ballet and opera costumes in Mackie’s repertoire, FIT mounted a major retrospective, several celebratory books on his oeuvre can be found. * Fern Mallis was for 10 years the executive director of the Council of Fashion Designers of America (CFDA), acted as senior vice president of IMG Fashion, and created New York Fashion Week. She now heads her own international fashion and design consultancy as well as helming this series at the 92Y. Mallis’ well researched, keep’m moving style still gives her guest ample time to reflect and respond. An illuminating and entertaining event.